A study came out last week in Morbidity and Mortality Weekly Report about the increasing risks people aged 75 or older face when it comes to traffic accidents. Overall, pedestrians make up 4,000 of the nearly 34,000 traffic-related deaths in the U.S. each year, according to the U.S. Centers for Disease Control and Prevention. But traffic-related deaths for men and women aged 75 and older were more than double those of people aged 34 and younger. Frailty, vision and physical disabilities as well as a decline in mental function can all lead to accidents while crossing the street. What’s so important to remember is that pedestrian fatalities can be prevented! In addition to steps the city can take such as installing speed bumps, enforcing speeding laws, and creating pedestrian safety zones, we can take action as well. Helping our loved ones and even complete strangers who are elderly cross the street is one way we can help as a society. Don’t be afraid to talk with your loved one about your concerns for their safety. Remind them to pay attention to stop lights, walk only on the sidewalks and in designated pedestrian areas and stay alert while cross the street. Sometimes it’s nice to get out of the house for a walk and enjoy the weather, but if your elderly loved one is running an errand into a traffic heavy area it may be best to drive them yourself or encourage them to take the bus or train. 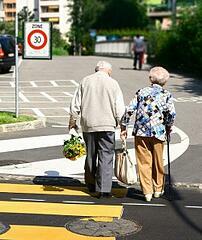 Talk to your loved one about wearing light colors or wearing reflective material while walking in busy areas. If it’s dark, carry a flashlight. Do everything you can to make sure drivers can see you.